This red clay Aleppo soap by Lauralep is an ancient skincare product that helps maintain all-round beautiful skin. 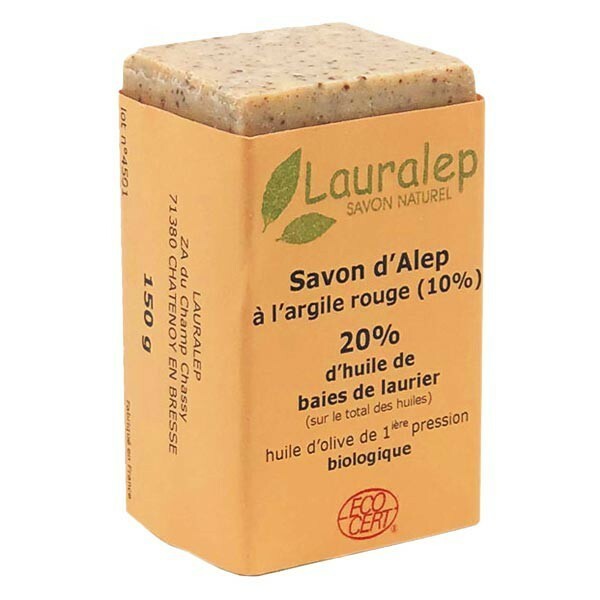 Blending a range of powerful natural ingredients, this 100% organic soap is packed with nutrients, vitamins and minerals, including red Aleppo clay to brighten and cleanse the skin, olive oil to soften and renew, and bay laurel oil for its antiseptic and soothing properties. Renowned for its nourishing properties, this red clay soap has traditionally been produced for over 3,500 years by the Akila family business in the ancient town of Aleppo, Syria. To use, rub between wet palms to create a lather and massage into the affected areas of the face and body before rinsing thoroughly. For best results, use day and night. Cosmeto Nature's natural soap range also features traditional Aleppo soap with nigella seeds, suitable for acne-prone skin. Free of fragrance, dyes and preservatives.